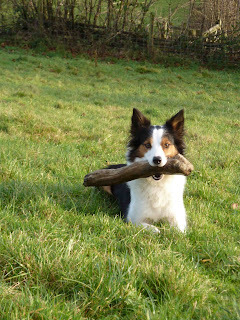 Little did I know when I posted our video The Collie Walk on last week's blog that so many people would view it. OK, so we haven't attained mega star status but 14,000 views in one week is pretty good going for a small, unplanned video captured whilst playing in a field with the dogs. The Collie Walk was completely unplanned. A glorious day in a field, just me the dogs and camera. I’m still learning the video part of the camera - hence all the zooming in and out! If you watch the video it does become apparent where the focus of each of the dogs lies. The senior dog is Womble Bum, she’s the one in a down closest to me. Her focus has always been on me unless there have been more interesting things to focus on ... a leaf blowing by in the wind, a blade of grass, a tennis ball ... you get the gist. 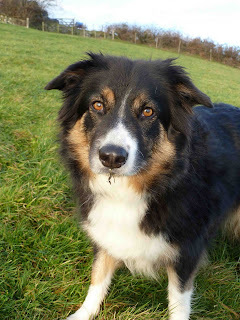 Next dog to come along was Handsome Lad, he’s the second dog to start ‘The Walk’. Watch carefully and you will see that he is clearly focusing on Womble Bum - a quick sideways glance to his left, well that's towards the flock of 35 Herdwick sheep in the next field! Then came the third dog, Cafe Latte Girl. Something very special from a very early age, introduced to sheep at 10-weeks of age - it became very apparent then that she was incredibly stylish. Since that early introduction she has ‘worked’ the dogs when not working sheep. There is a 10 month gap between Handsome Lad and Cafe Latte Girl so it’s quite natural for her to focus on him. So where do the two Highland Hooligans, that’s the New Boy and Arctic Fox, come in? Well, Arctic Fox was the fourth dog on the scene, when she arrived Cafe Latte Girl decided she’d play surrogate Mum, so Arctic Fox has her focus set on Cafe Latte Girl - you’ll spot the pattern that’s developed! The Arctic Fox doesn’t tend to do ‘The Walk’ too often, though she can. She much prefers to run around the field hanging off CLGs collar. The New Boy, fifth dog to arrive earlier this year, and the one who prompted the blogging, walks up beautifully on sheep, but he’s been a working lad from a young age and is quite clear with the boundaries! That’s the explanation behind the focus, now what’s actually going on in the video? 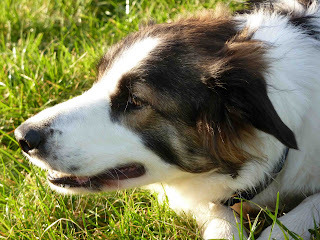 The only ‘forced’ behaviour was to put Womble Bum in a down stay when everyone else had put themselves into their own downs, quite naturally as that’s what collies do, about the field. Once she was down, the Cafe Latte Girl started walking up onto the Handsome Lad at which point I started filming - there was quite a lengthy bit of walk missed as the camera wasn’t on. When she came in behind Handsome Lad then I put a walk up cue onto him. So starts his walk up onto Womble Bum, CLG is still clearly focused on him. The two Highland Hooligans are still on the hill, watching the others playing silly beggars. As Handsome Lad gets closer to Womble Bum, another stay is given to her, and another ‘walk up’ to him just to bring him in a bit closer. Then the break, with a swift ‘that’ll do’, but look again, it is Womble Bum who starts the break and every one of them refers to her ... she is after all, my top dog. They all rushed around madly completely relaxed with no built up tensions and certainly no problems between them, ready to start the game all over again! I love my dogs! Thanks for the explanation, not that I thought anything was wrong with the behavior, I loved the video. I am just fascinated with the training and behavior of dogs. Anyone who reads your blog can tell just by how you write about them that you are crazy about your dogs! They are truly gorgeous. Love it!! This clip showed up on dogwork.com and I forwarded via Facebook and email to all my friend here in the U.S. and Australia. The music is very appropiate for them.This is one of the funniest videos about dogs I have ever seen,It is as if they were playing "What´s the time Mr.Wolf? It´s dinner time!" I watch it sometimes to cheer me up,thank you very much! This was just amazing...they are just the smartest dogs...probably the reason why I have never lived with one (or six) is that I don't have enough for them to do and what a shame not to provide them with what makes them the joyful intelligent beings they are...thank you so much. Love watching this video over and over. I can see the same behaviour in my dog, and he doesnt even chase the sheep. 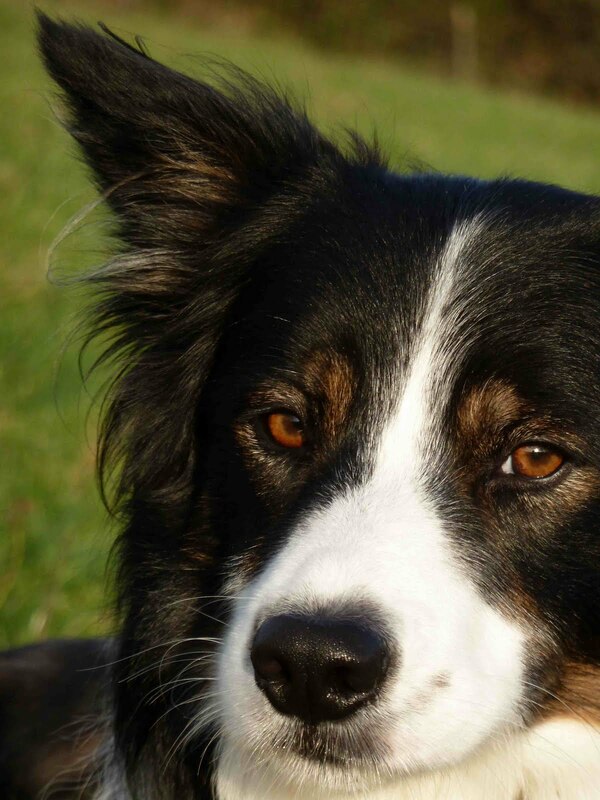 my late border collie came from a llama farm here in israel,and watching little collies working those big llamas was a delight.. This is one of the best videos that I have seen. Your dogs are beautiful and it is striking how they execute such delicate and slowly-timed steps. 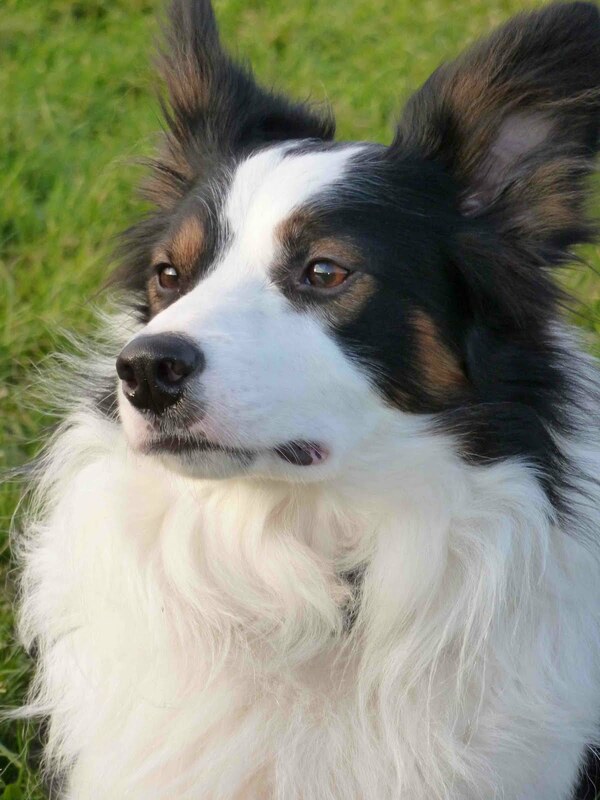 I am mesmerized by their graceful movements and the music is perfect for their Collie Walk. This video has a wonderful calming effect...like some kind of doggie-zen for humans! Thank you for posting it. watching this makes my day, again and again, thanks !!! What's the time Mr Wolf? Of course!...we played it as kids. I knew I had seen this game before!